Bissière spent many years searching for a personal style, which he did not really find until 1947 with his exhibition at the Galerie Drouin (his last exhibition had been in 1928 at the Galerie Druet), which included 30 oil paintings and 7 tapestries. He was by now 59 years old. The result of several years’ work done in his house at Boissiérettes, to which he had retreated in 1939, this ensemble, slowly developed in solitude and silence, is inspired from his return to his family land, which enabled him to reconnect with his roots, his only “confidants myself and a few quiet cows whom I took to graze in the meadows beside the woods, beneath the sun and the clouds,” as he wrote in his preface to the exhibition (T’en fais pas la Marie. T’es jolie…, 1947). With his doubts, and the ordeals that he had faced, he established secret connections with his surroundings. This return to his roots was a form of reconciliation with the world, and it generated an osmosis in which the harmonious countryside is reflected by his chromaticism, where rhythms and colours conduct plastic, visual and sensory exchanges. Bissière identified entirely with his painting, devoting his life to his work. Bissière’s paintings, whose titles add to their pastoral, poetic and almost Virgilian effect (Pastorale, Clair de lune, Hommage à Théocrite, Églogue, Le Vacher… in other words: “The beasts, the trees, the wind and the sun, everything that the little brother of Assisi loved so much, all that has taken on a new meaning for me, its real meaning… It was simply necessary to satisfy a desire to confess. And the only point of a confession is to be entirely open” (preface. Op. cit.). This revived an archaism that disconcerted the public. A new thematic introduces rupestrian images, evoking primitive tapas, diagramatic figures, resurgences of Roman tradition, an ancestral art indissociable from this land of the langue d’oc: (Saint-François d’Assise, Cathédrale aux deux anges). This is nothing less than a sublimation of the texture and colours whose visual enchantment calls out to each of us. “Lying in the grass, in the strong green light, the thick woods, meadows, the gleaming pond and the beasts with their light coats, all that no longer exists. Under my eyelids there was an iridescent mass, where colour and light penetrated and generated and an entire unknown poetry arose, reducing my previous experiences to nothing” (Bissière, preface. op.cit.). This humility, with what appeared to him to be an unavoidable statement, was on a par with a lucidity, intelligence and knowledge of painting, with a full awareness of the many movements from which modern art sprung. Cubism to start with, whose historic limitations he assessed and which he rapidly gave up. This pictorial knowledge was visible in Bissière’s many writings on aesthetics which appeared in the review L’Esprit Nouveau(1920–1921, notes on Seurat, Ingres, Corot). Haunted by scepticism, considering that the act of painting sufficed in itself, he was reluctant to exhibit. This is what he said about his time at the Académie Ranson where he taught between 1923 and 1937: ”I believe in neither education nor experience, only in the most primitive instinct which comes from the depths of time. The only thing which it is necessary to transmit to others, is precisely that which is untransmittable and which lies in the depths of mankind and which no other than he can capture,” a premise which applied to his painting, about which he said: “I lull myself with improbable stories on which I place colours.” What a breeding-ground his studio in rue Joseph-Bara was, however, producing major names that today embody the French school: Gruber, Manessier, Bertholle, Le Moal, Garbell, Vera Pagava… who, in the master’s words, were never pupils, simply friends who came there to work with him: “They gave me as much as I gave them” (R.V. Gindertaël, Cahiers d’Art, 1953–1). In 1947, on his return to Paris, Bissière resurfaced in the art world, showing his recent works at the Galerie Drouin – an event which was preceded by l’Hommage à Bissière, organised as part of the first Salon de Mai in 1945, at which he again showed in 1958. Nevertheless, he continued to live and work at Boissiérettes, restoring and making habitable an old ruined presbytery inherited from his mother; he decorated it, making and painting his own furniture. Between 1940 and 1944 he practically did not touch a brush, devoting himself to various types of manual work, such as building an oratory, which he painted with frescos, or making sculptures from scrap material: bone, wood or iron, which he assembled (for example, Christ, c. 1942). This taste for salvaged materials, which stimulated his creative imagination, can also be found in the tapestries exhibited in 1947. “I had neither a brush nor oils, so I made my paintings with rags and bits of colour.” With his wife, Mousse, he made hangings with pieces of used fabric, bits of embroidery and knitwear, such as Le soleil (Musée National d’Art Moderne), Chartres, a tapestry today in the collections of the Musée d’Unterlinden in Colmar, which houses the Grunewald Issenheim altarpiece, a work which Bissière greatly admired when he saw it in 1956 purchasing a reproduction for his studio. Destiny had brought them together. “Paintings like the others, made of fabrics placed side by side, torn and intertwined” (Bissière, preface, op. cit. ), “in placing these pieces of fabric side by side, I learned a lot.” He “realised to what extent placing a clear tone over another tone transforms the whole” (G. Boudaille, Cimaise, 1961). During these years of isolation and poverty, Bissière became aware of truly pictorial resources. His son Louttre worked with him in his studio. A personal event now completely transformed his work. Suffering from glaucoma, he began to lose his sight, putting off, however, the idea of an operation. Several years of uncertainty ensued, during which Bissière scarcely worked. He did make, however, a few works painting with egg. His experience with tapestry encouraged him to employ bright colours (his research into colour dates from 1944); the whites take on a brightness and the line becomes less precise. In 1950 he finally decided to go ahead with the operation, which proved a success. He spent his convalescence on the Île de Ré, in the house of a doctor friend, where he painted with egg a series of small works on various media: used paper, planks, used canvases. 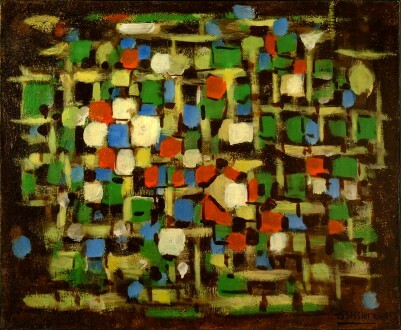 Image sans titre 1950–1951, a group of small works included in his first exhibition in 1951 at the Galerie Jeanne Bucher, where he now exhibited, and which are a song of recognition, a hymn to life. Although the signs and marks suggest huge expanses of beach swept by the wind and glowing with sunlight, with a bannered jetty appearing in the distance, Bissière distanced himself from representation in order to suggest it with more effect. After 1947 the lines become blurred, freeing unexpected coloured stains in blues, yellows, greens, reds and ochres, with rarely more than two or three stains at once. Prepared directly on his palette, the coloured powders retain a surprising luminous chromatic vibration despite their mat aspect. Bissière possessed a sense of values which, while enabling him to create space, install the picture plane. The drawing forms a pattern based on squares, rectangles and circles, containing a hieratic silhouette, naive, with symbolic hieroglyphics. This elimination of the subject could suggest Bissière’s adherence to abstraction. As he himself explained, this was not, however, the case: “I have constantly repeated that, although I am non-figurative, I absolutely refuse to be abstract. For me a painting is only valid if it has a human value, if it suggests something and if it reflects the world in which I live, the landscape which surrounds me, the sky under which I move, the morning or evening light. I do not seek to imitate all this, but unconsciously I adapt it and re-establish it in what I do… I try to recreate my own world, composed of my memories and emotions, which contains the smell of the forests that surround me, the colour of the sky, the light of the sun and also the love that I feel for everything that lives, plants, beasts and even men and their miserable condition” (letter published by Georges Boudaille in Les Lettres Françaises, 6–12 January 1966). This statement says everything about Bissière’s work. The exhibition of 1951 was a success. Nicolas de Stael admired the paintings of beaches. A sound friendship was formed with Jean-François Jaeger, who organised Bissière’s next exhibitions held at the Galerie Jeanne Bucher. In 1952 there was a further presentation of large paintings with egg, including Gris et rouge (Musée de Grenoble), Bleu (Amsterdam Museum), Jaune et gris (Musée National d’Art Moderne), La Croix du Sud (The Hague Museum). The public was enthusiastic about this instinctive and introspective work. In December of that year, Bissière was awarded the Grand Prix National des Arts. He made a number of lithographs and a few monotypes. In 1953 he painted elongated works, often vertical. From 1954 he gave up tempera and returned to oil painting, rediscovering chiaroscuro, and transparency. The network of lines began to resemble the mesh of a net, for example in Composition grise (Bergen). Cultural references are abandoned, leaving poetry to triumph. Jeanne Bucher published Cantique à notre frère Soleil de François d’Assise, a work produced with the printmaker Fiorini: 11 woodcuts in colour, printed in copperplate (Paris, Musée d’Art Moderne de la Ville de Paris). In 1956 there was a new exhibition at the Galerie Jeanne Bucher with large canvases: Souvenir de Ville-d’Avray (Rotterdam, Boymans van Beuningen), La Forêt and Equinoxe d’été (Paris, Musée National d’Art Moderne) and Paysage égyptien (Zurich, Kunsthaus). In 1958 he showed 34 small oil paintings on paper under the title Les quatre saisons, murmured confidences full of light. In 1962 the Galerie Jeanne Bucher, which had opened new premises in rue de Seine, showed 34 paintings of great intensity and an impressive meditative quality: Le jardin cette nuit, Agonie des feuilles. Mousse died shortly afterwards and Bissière stopped painting. When in 1964 he exhibited his Journal 1962–1964, everyone understood that, reaching beyond death, the artist was continuing a dialogue with Mousse, who had been inseparable from his creative path. That year saw the publication of Journal en images by Hermann, with a preface by François Mathey. Bissière, who had “always been against juries; against medals and rewards,” and who hated “fairs”, as he described the salons which his work had so much difficulty fitting into, nonetheless agreed, on Jacques Lassaigne’s request, to represent France at the Venice Biennial in 1964 (he had already showed eight works there in 1954). He considered that, faced by the establishment in Europe of American painting, France stood no chance. Facing Pop Art, Bissière received a Distinction from the jury, an honour that was never to be awarded again, although Rauschenberg received the Grand Prize. Indifferent, solitary and refusing any compromise, he painted Silence de l’Aube, Silence de Midi, Silence de la Nuit and Silence du Crépuscule. Shortly before his death, he covered three large paintings with a white veil – voile de Véronique, miroir – covered with black crosses. Bissière is buried with Mousse close to his studio in the garden at Boissiérettes. In 1959 the Musée National d’Art Moderne paid him a tribute with a retrospective accompanied by a catalogue prefaced by Jean Cassou. This was followed in 1961 by Hommage à Bissière at the Salon d’Automne (Grand Palais). In 1965 there was a solemn tribute to Bissière at the Musée National d’Art Moderne de Paris, with an address given by Gaétan Picon, and a retrospective at the Musée de Bordeaux, with a catalogue prefaced by Max-Pol Fouchet. 1966 Rétrospective at the Musée des Arts Décoratifs. Pavillon de Marsan, Paris. Catalogue. Text by François Mathey, followed by notes by Bissière. Retrospectives were held at the Stedelijk Museum in Amsterdam and the Kunsthalle in Dusseldorf in 1960. He took part in the Salon des Réalités Nouvelles in 1956, 1959, 1960, 1961 and 1967, with a tribute in 1965; l’École de Paris, Galerie Charpentier in 1954, 1956, 1957, Gris et violet (Musée du Luxembourg) 1958 and 1963. Exhibitions of Bissière’s work were held at several museums outside France: retrospectives in 1957 in Hanover, Recklinghausen and Lubeck; in 1958 in Eindhoven and Amsterdam; and in 1962 in Lucerne, with catalogues. He was invited to show 10 works at the 2nd Sao Paulo Biennial in 1955 and took part in Kassel Dokumenta I in 1955 and II in 1959. 1962 Tokyo Biennial where he received a prize for his prints. Bissière’s work was included in all the group exhibitions presented by the galleries that defended young non-figurative painting, for which Bissière was considered the ‘father’: In 1952 the Salon d’Octobre, the series of exhibitions Situation de la peinture d’aujourd’hui at the Galerie Ariel in 1954, 1955 and 1957. Trente Peintres de la Nouvelle École de Paris in 1955. Regard sur la peinture actuelle, Galerie Mathias Fels, in 1958. Permanence et actualité de la peinture, Galerie Raymonde Cazenave, in 1960; and the same year Hommage à Jeanne Bucher in the gallery of the same name. Bissière made stained-glass windows for the churches of Cornol and Develier (Swiss Jura) in 1958, as well as for the north and south transepts of Metz Cathedral in collaboration with Charles Marq. Bissière left many writings about his painting. 1986 Bissière 1886–1964, Musée d’Art Moderne de la Ville de Paris, then shown in the Musées des Beaux-Arts of Dijon and Calais in 1987. Catalogue by Patrick Le Nouëne. Complete biography and bibliography. 1990 Bissière, Paysages du Lot. Maison des Arts Georges Pompidou, Cajarc. Catalogue. Bissière’s works are present in many museums in France and abroad. Max-Pol Fouchet: Bissière. Le Musée de Poche, G. Fall, 1955. Daniel Abadie: Bissière. Ides et Calendes, Neuchâtel, 1986.